While in jest, one Southern Illinois University Edwardsville Head Start/Early Head Start teacher has two supervisors both wanting her for their centers, and not because of her recent accolades. Chea Wyatt, child development supervisor at Bluffview Head Start Center, was chosen as the Illinois Head Start Teacher of the Year and the Region V Teacher of the Year for 2015. Region V consists of Illinois, Indiana, Michigan, Minnesota, Ohio and Wisconsin. The recognition makes Wyatt eligible to compete for the national 2016 Head Start Teacher of the Year. “Chea takes so much initiative in her work,” said Marcia Oliver, who nominated Wyatt. “Whatever is required for her to get the job done, she does it. “Yes, she’s staying right here,” chimed in Kathleen Appleby, Bluffview Head Start Center coordinator. Wyatt said she is glad to be at SIUE Head Start/Early Head Start and helping make a difference in children’s lives. Wyatt has worked with the SIUE Head Start/Early Head Start program for four years. She started out as a child development associate at the Tenth Street Head Start Center in East St. Louis. Later, in 2015, Oliver became Wyatt’s supervisor, and the Head Start center was moved to the Jackie Joyner Kersee location. When Wyatt received her bachelor’s in early childhood education from SIUE in May 2015, she wanted to advance to a teaching position or child development supervisor. However, no positions were available at the time. Eventually, in September 2015, a teaching position did open at Bluffview. Wyatt is teaching a classroom of approximately 18 students, ages 3-5. “My job is to be the best teacher I can be,” she said. “I provide a safe and nurturing environment for children to learn. But working as a teacher today can be trying because of the challenges many children face in their homes and communities, she noted. The SIUE Head Start/Early Head Start Program is a nationally recognized quality early childhood education program that promotes school readiness for children and self-sufficiency for families. Services are available to St. Clair County expectant parents and families of children ages six weeks to five years old. The Head Start Program currently provides services to 1,314 children and families and the Early Head Start Program serves 188 children and families. Both programs include children with specialized needs and English as Second Language Learners (ESL). Chea Wyatt, Illinois Head Start Teacher of the Year and the Region V Teacher of the Year for 2015, enjoys teaching her students, ages 3-5. 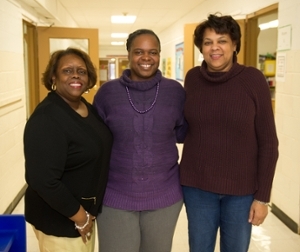 Chea Wyatt (center) poses with her former supervisor on left, Marcia Oliver, coordinator of the Jackie Joyner Kersee Head Start Center, and her current supervisor on the right, Kathleen Appleby, Bluffview Head Start Center coordinator.